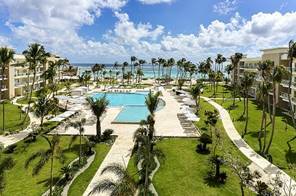 The first Starwood property to open in the resort of Punta Cana. Whether you choose an all inclusive golf package or an a la carte experience, you will truly enjoy the amenities this property offers guests. Within the gates of the PUNTACANA Resort & Club, you will find 54 holes of golf, a beach club, several restaurant options, 2 hotels, and an equestrian facility. When you purchase one of our Golf Inclusive packages, you also get to take advantage of the airport whisking service, no need to wait in line at Immigration. select alcoholic and non alcoholic beverages, house wine and full selection of beer and bar service on golf course included.